There are many different things to consider when choosing engineered wood flooring or solid hardwood flooring. Most people think that solid hardwood is far superior to an engineered hardwood. However, that is often not the case and, as with anything, there are advantages to each type. Unknown to many, engineered floor is not laminate but is a real wood floor. There are many advantages to installing this in your home. It is very stable because the grains of each layer run in opposite directions. This makes it resistant to thermal changes and moisture. It is an ideal choice for a home in a very humid area where wetness may cause the floors to warp. Its resistance to heat and water make the maintenance of your floor easier. There are also multiple options for installation. The floors can be nailed, glued or stapled into a subfloor or they can be floated above a subfloor. 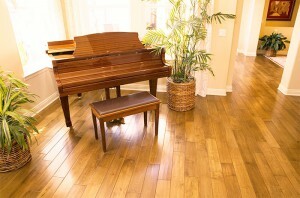 Solid hardwood flooring is a classic and beautiful choice for your home. It comes in a variety of different types of wood and thickness depending on the look you want for your home. It is also resilient to wear and tear. Typical maintenance includes drying up spills so that the floor will not warp. These floors can also be sanded and refinished to give them a fresh look. They offer a chic and versatile option for your home. This type of floor is installed by being nailed to a subfloor. A professional flooring company can help you to install new solid hardwood or to match floors that you may already have installed in your home. There are differences between an engineered versus a solid hardwood. They both create a unique look for your home while differing in types of installation options and durability. Engineered floors withstand more temperature extremes while a solid hardwood can be sanded down more to create a fresh look. An expert floor company will help find the best hardwood flooring for your home.